Sandboxes are always an exciting and fun-filled place for children. It'll keep them occupied for hours and you can keep an eye on them too. 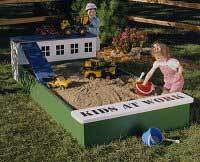 This Sandbox Plan is designed keeping kid's safety in mind and is built from common lumberyard stock. You'll keep your kids, grandkids (and probably neighbor kids, too) happily occupied for hours. Build it from common lumberyard stock.